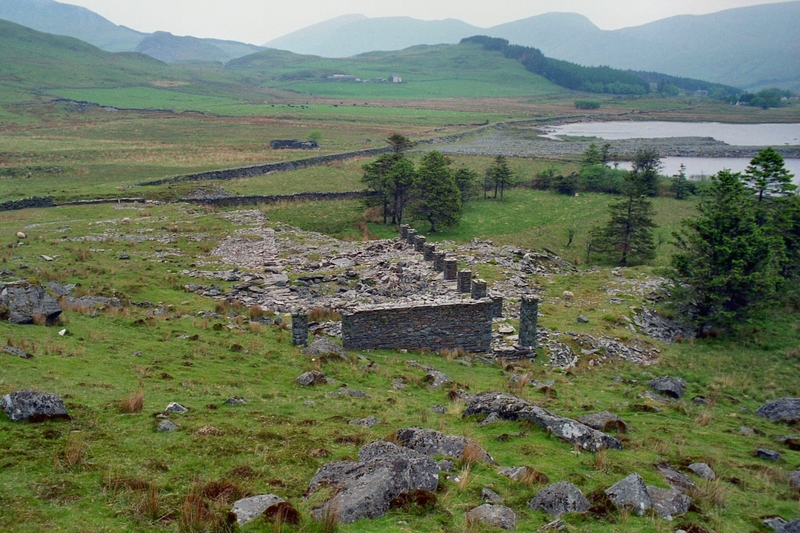 Close to Rhyd Ddu, Llyn y Gadair* is located alongside the western shore of the lake of the same name and is made up of two small, seperate workings. 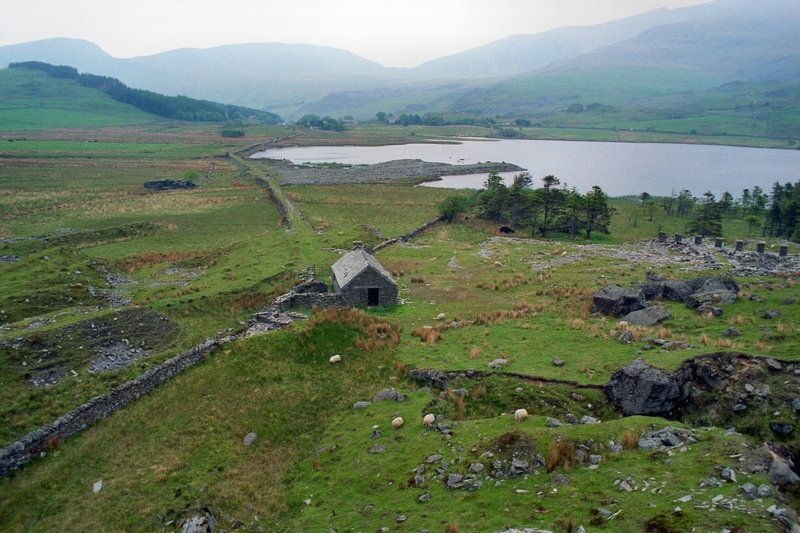 The southern of the two, Gader Wyllt, is a working into the hillside with few levels and some possible underground attempts, while the other is Llyn y Gader - a small Nantlle style pit situated slightly to the north. The photo above shows the approach to the site (as it was in 1990) along a causeway that may have been used for an exit tramway - more on that later. On the right can be seen Llyn y Gader, while straight ahead is Gader Wyllt. * The name Llyn y Gadair is often used to cover both workings. 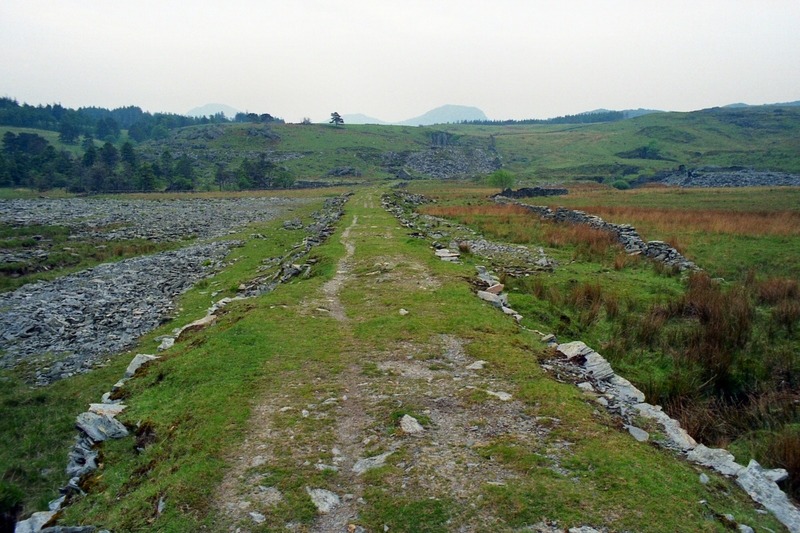 Photo 02 shows the view from the tips of Gader Wyllt, looking back along the causeway towards Rhyd Ddu. The small building (centre) is the only one intact on site, still retaining its roof (nowadays roofless and a ruin) while there are the remains of an unfinished 'New' mill over on the right. Lower right is a cutting into the hillside, but had no sign of an adit. The wall running through the site to the shore of the lake denotes the boundary between two seperate landowners. Also note the tips running out into Llyn y Gadair - these belonged to Llyn y Gader but were abandoned before the causeway was built, which bisects them cutting off access. The large 'New' unfinished mill on lake level, built on top of waste and dating from the later period of the quarries working life. Did the waste come from an adit in the previously mentioned cutting? Nowadays the L�n Gwyrfai path cuts through here on its route south to Beddgelert, using the causeway to reach here before passing through the corner of the mill and then continuing alongside the lake to enter Beddgelert Forest. Behind the camera, on the level above, is a tramway route running to an abortive underground working with remains of dressing sheds along its course. Up on the main working level (1) is the remains of this mill. 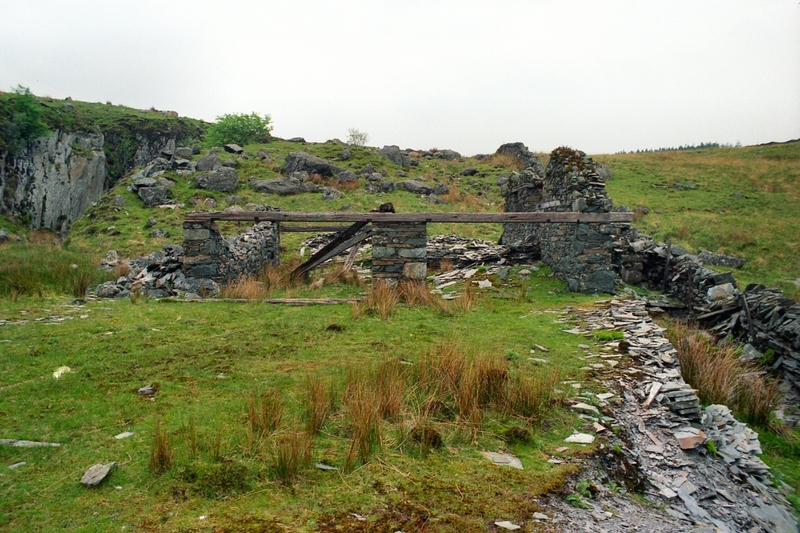 Built largely of rock rather than slab, it has large wooden beams and trusses that may have been sourced from the Llyn y Gader mill.